I like reading success stories. In fact, I wish there were more of them in the agile literature because a success story is “evidence” of doing something that works and it is not just an abstract idea or concept with potential. That’s one of the reasons I like Scott Granieri’s article featured on scrumalliance.org entitled, “Sometimes it just may take a waterfall to go agile.” In this article, Granieri describes a situation occurring at a corporate level to create software for a federal customer. He presents the background, the problem, the solution, the results and the lessons learned. I find this article to be well-written, thorough and engaging. 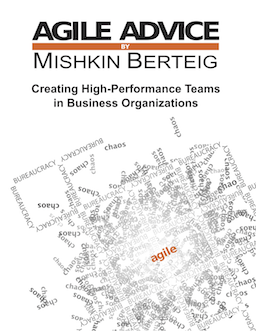 “The solution for creating a successful environment for Agile adoption lies within one of the principal tenets of the methodology itself: Inspect and adapt.” He also quotes Ken Schwaber, co-founder of Scrum, who Mishkin Berteig trained with more than a decade ago. But that can be something for you to discover when you read the article.